From fishball vending at the Quezon City Hall, ABS Bitter Herbs creator Grace Galindez-Gupana went on to establish a multi-million-peso herbal supplements company without the aid of a business or a medical degree. Grace started in business at the age of 18. Still out of a job a year after graduating from a course in secretarial management, the feisty lady took her 800-peso savings to buy art materials from the nearby palengke. She then proceeded to lock herself in her room and didn’t come out until she finished designing bundles of cards carrying Bible passages. These she sold to Christian bookstores, netting her P2,400 that month. Not bad for her first try at sales.With no business background to fall back on, Grace relied on her faith in God and hard work to set up her own business. “Ako yung tao na kapag humingi ako kay Lord, ini-expect ko na kaagad. Sabi ni Lord, ‘Ask and it shall be given.’ Alam ko Lord, ibi-bless mo ako. So walang doubt. Ganun ako. Yun pala ganun ang attitude na gusto ni Lord (I‘m the type of person who when I ask something from God, I would expect an answer right away. The Lord said ask and it will be given. So, I said, ‘Lord, I know you are going to bless me.’ I don‘t doubt. And I discovered that that is the attitude the Lord wants),” shares the mother of four girls. “And the Bible also says whatever you plant, you harvest. Whatever you sow, you reap. Eh masipag kasi ako (I am very hardworking). So pag masipag ka (If you are hard-working), definitely you harvest.” Grace linked up with a company with a chain of bookstores nationwide to sell her cards. By the end of that year, she owned 2 bookstores and an arts and crafts factory, earning Grace her first million at 21.When she married her husband Paul in 1987, life couldn’t be better for Grace. Her businesses had now expanded to include a flower shop and a restaurant. “It became easy for me to get rich. It was an easy 1 million, because we had many outlets. Kaya lang naging proud ako (But then, I became proud), because I did it my way. In an instant, I lost it all,” she admits. After giving birth to twins, she and her babies had to be confined in the hospital for many days, incurring bills amounting to 2 million pesos. In a matter of months, she was again down to her last 800 pesos. “Promotion and demotion come from God. Pero kahit na na-dedemote ako, nag-pre-pray ako (But even when I get demoted I continue praying),” she recalls. Humbled, she repented of her ways and learned to submit to her husband.After that heartfelt prayer, she found herself in the market again, this time to buy ingredients for her fishball stand in front of the Quezon City Hall. “Alam naming hindi kami matatanggap sa trabaho, di magtinda ka na lang. (I knew I won’t be able to get a job so I decided to just sell.) Bakit fishball at sago‘t gulaman? Kasi yun ang madali eh (Why sell fishball and sago‘t gulaman? Because those are the easy ones to prepare),” she quips. Grace woke up as early as four at sell her wares. But her hard work paid off eventually. There were days when she would earn as much as P30,000 and sometimes even double that amount. The secret, she says, is prayer. “ Pinag-pepray ko tuwing umaga. Kapag pinag-prepray ko, ubos. Kapag hindi ko pinag-pray hindi nauubos, (I would pray for the fishballs everyday. When I pray, my fishballs get sold out, but not so when I forget to pray),” she says. She also treated her customers like royalty to keep them coming back. “Huwag ka tumingin sa itsura ng tao sa patitinda (You can‘t look down on the people you are selling to). Be fair to others,” That one stall at the QC City Hall multiplied into several stalls around Metro Manila. To help other aspiring entrepreneurs, Grace conducted livelihood projects and seminars. She also founded Nego Pinoy Club, an organization of Filipino entrepreneurs. It was during a trip to the US in 1998 with this group that Grace met a Filipina with an American husband, who told her to look for 7 types of medicinal vegetables and herbs that can only be found in the Philippines. These herbs, the lady said, was very good for the health. At that time, Grace was incidentally praying for a new business. “Lord, sabi ko, nakakapagod naman itong fishball. Bigyan mo naman ako ng negosyo na mas madali (Lord, I prayed, selling fishballs is so tiring, please give me a business that is easier to manage),” she begged. When Grace came back, she did intensive research to discover for herself if these herbs were really beneficial to the body. In a matter of months, she came up with Active Bitter Supplements or ABS Bitter Herbs capsules. “Na-realize ko bigay nga ito ni Lord, kasi pinakita sa akin yung mga capsules nagiging ginto (I realized that this business is from God because I saw in a vision that the capsules were turning into gold) Sabi ni Lord, ‘Anak, yang negosyo ko binigay ko sa ‘yo kasi pang- purga yan sa katawan, pang-linis ng tao’ (The Lord told me, ‘I gave you this business because it detoxifies the body and cleans the system‘),” she shares. Made up of lagundi, luyang-dilaw, ampalaya, malunggay, peppermint, andrographis paniculata and saluyot, ABS Bitter pills is said to be helpful in detoxifying the body of harmful toxins. It also enhances the immune system, improves blood sugar and supports digestion. “Ang tawag ko dito gulay in a capsule o Pinakbet in a capsule (I call these pills vegetables in capsule or Pinakbet in a capsule),” she jokingly shares. ABS, however, is best known in the market as a diabetic supplement. Endorsers Gary Valenciano, Juan Flavier and Mike Enriquez say it helps them control their insulin intake. 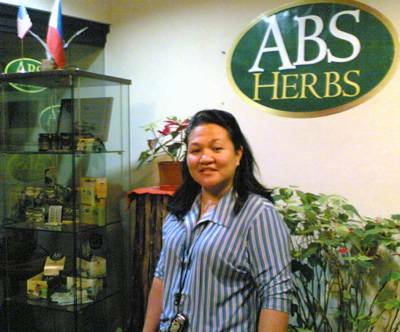 ABS Gen Herbs International Corporation, a 100% Filipino-owned herbal supplement company–which includes a seven-story building in Quezon City and 2 factories Taguig and Rizal–was established by Grace and Paul in 1999. Grace, however, takes no credit in the success of the company. “Nag-bebenta lang ako ng fishball, anong alam ko, di ba? 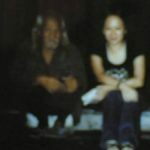 ( I was just a lowly fishball vendor. What do I know? )” she self-effacingly shares, “Kaya si Lord talaga ang may bigay ng business na ito. Sa lahat ng desisyon, kinukunsulta namin siya. 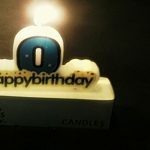 (That‘s why I can say that God is the one who gave us this business. We consult him in all our decision. )” They must be doing the right thing, because in 2002 the company received a Rising Star Citation from the Golden Shell Awards. It is also the only Filipino herbal supplements company that has received a certification from NSF, a world leader in standards development, product certification, education and risk-management for public health and safety. Despite the stiff competition, ABS Gen Herbs remains a strong contender in the market with an estimated sales of P20 million monthly. It exports 30% of its products to America and Europe through Diethelm, an international distribution company. 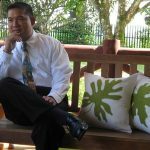 The goal of the ABS Gen Herbs International, according to Marketing Manager Rads Saringan, is to be the leading herbal supplement company in the country within the next five years. This they plan to achieve not only through more aggressive sales strategies, but by also taking good care of the mental and spiritual well-being of their staff. For this to happen, Paul and Grace instituted Bible studies and prayer meetings as part of their weekly agenda. ABS Gen employees are also encouraged to read books and listen to teaching tapes to help them upgrade their skills. Even with the success and accolades she has received, this down-to-earth lady entrepreneur continues to be tireless in her efforts to develop and promote Filipino herbal products to the world. “I really love what I am doing. I give it 110%. Kahit ampalaya lang yan (Even if it‘s just ampalaya), I give it my best. The measure you use will be measured back to you. Sabi ko, ‘Lord, itong produktong ito hindi lang pampamilya, pang-isports pa, pang-international pa,’ ka-dedeclare ko (I said, ‘Lord, this product is not just for the family, it‘s also for athletes and it will be known internationally.’ Because of this declaration), I was invited to a US exhibit and I also met golfer Dorothy Delasin who became my endorser. And so my product was able to penetrate the US market,” she shares. Aside from ABS Bitter Herbs, the company also carries ABS Herbal Tea, Circumax 5+ Ginseng, Charagen Forte Bitter Melon capsule and Charagen Bitter Melon. “Tatlong bagay lang ang nasa likod ng tagumpay ng ABS Gen Herbs International. Unang-una, ang pananampalataya naming sa Diyos, ang aming relationship with Him. Then, the power of prayer and obedience. (There are only three things behind the success of ABS Gen Herbs International: our relationship with God, the power of prayer and obedience). Money will not make you strong. Position will not make you strong. Possession will not make you strong. Prayer will make you strong, so that’s the key. Claim God’s promises. Marami kasing tao dyan, binigyan na ni Lord, kinahihiya pa (There are a lot of people who when God gives them something, they become ashamed of it). Ako, hindi. Ako sabi ko yung produkto ko the best! (I’m not like that. I always say that my product is the best!) In my own right, it is the best,” ends Grace. A very inspiring story worth telling to my friends and family. A triumph of faith and dedication worthy of praise. Should be recommended for a lifetime achiever award of sorts. Keep your articles/thoughts on life of faith coming! I’m blessed! God bless you. You captured really great pics. Very inspiring story of faith,thank you for sharing. I was wondering where I can get those Charagen ampalaya tea here in US? Thanks.